Provide comfort for the family of Margaret Kvas with a meaningful gesture of sympathy. It is with great sadness we announce the passing of Margaret Kvas. Margaret passed peacefully at Toronto Western Hospital surrounded by her family on March 15, 2019 at the age of 91. Our sincere gratitude to the staff of Toronto Western, the tremendous care is appreciated. She will be rejoined with her devoted husband Jakob Kvas who has passed. She was a beloved mother to her children; Lily, Josie (Tone), Tilka, Jacob, Cathy (Joe), Peter, Teresa and Paul. She will be missed terribly by her grandchildren; Rebecca, Cassie, Tanja, Levon, Dylan, Joel, Simone, Candice, Antonio, Joseph, Michael, Peter, Jackie, Ami and her great-grandson Clark whom she loved so dearly. Family and friends are welcome to Bernardo Funeral Home at 2960 Dufferin Street, on Tuesday, March 19, 2019 from 2-4 & 6-9 p.m. Funeral Mass will be held at Our Lady of Miraculous Medal, 739 Brown’s Line, (Etobicoke; south of the Gardiner) on Wednesday, March 20, 2019 at 11:00 a.m., private burial to follow at a later date. At the request of the family in lieu of flowers, donations to a charity of choice would be appreciated to remember Margaret. 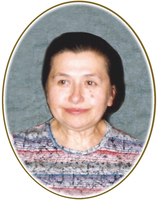 To plant a memorial tree in honor of Margaret "Marjeta" Kvas (Benko), please visit our Heartfelt Sympathies Store.